Save 40 calories and 3g of fat, including 2g sat fat, per serving by preparing with Reduced Fat OREO Sandwich Cookies, PHILADELPHIA Neufchatel Cheese, COOL WHIP LITE Whipped Topping, 2 pkg. (1.4 oz. each) JELL-O Chocolate Flavor Sugar Free Fat Free Instant Pudding and fat-free milk. Freeze dessert about 1 hour before cutting to serve. 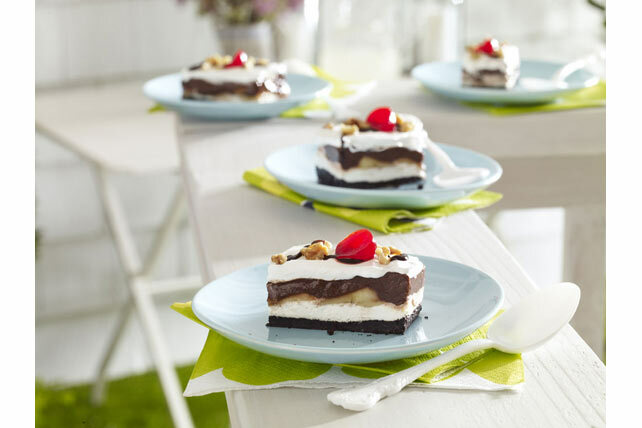 Dessert can be refrigerated up to 24 hours before topping with cherries, nuts and syrup just before serving.